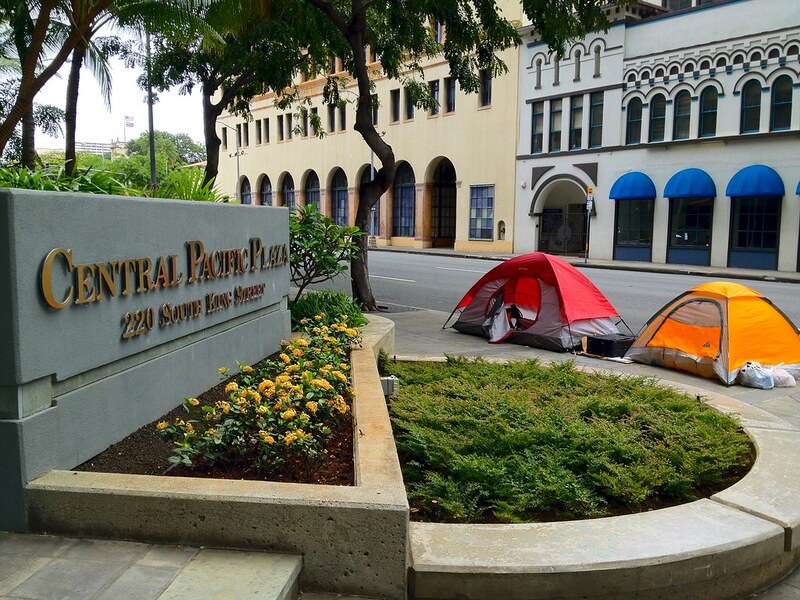 (De)Occupy Honolulu's usual "Financial Friday" foray into Honolulu's financial district took another step forward when the group decided to encamp on the sidewalk outside Central Pacific Plaza overnight. While maintaining an encampment at Thomas Square (in its 154th day of continuous encampment) a mile away, a group expanded its reach to the corner of King and Alakea Streets. That expeditionary force arrived Friday, April 6, and began a sidewalk protest. The group targeted the headquarters of Central Pacific Financial Corp for the loss of $61 million of the $135 million in TARP funds it received. While overcompensating its executives, it continues foreclosures against homeowners. "Banks got bailed out, we got sold out!" Private security guards advised the group that they would call the police at the 24 hour mark and have the group removed. A lone police officer showed up, surveyed the situation, and left. The security guard said that since the group was on public property and not obstructing traffic or storing items, there was nothing the police could do. It's not known how long the group will maintain its encampment but there are plans to pop up encampments anywhere there is a compelling need to point out financial injustice.